deal-buys has no other items for sale. 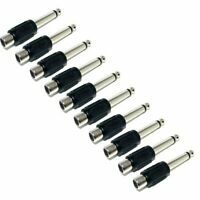 24X RCA Female Jack to 1/4" Male Phone Plug Audio Adapter for Mixer & Amp 24Pcs. There are 2,002 items available. Please enter a number less than or equal to 2,002. Quick Shipment & Securely Packaged! Thanks. Very fast shipping! The phono preamp arrived in excellent condition! Thanks! I gave this product the maximum 5 stars because it does exactly what I needed it to do, and it does so for very little money. I am not such an obsessive audiophile that I've run the output through an oscilloscope (or whatever tool one uses to measure such things) to scrutinize the signal for distortion. I judge the sound with, of all things, my ear. If the Pyle is degrading the signal, I can't hear it. The receiver I am currently using does not have a pre-amp out, but I wanted to be able to channel my phono through my equalizer. This Pyle pre amp made that possible. There is no on/off switch so it is constantly on. If this is shortening the life span of the unit, that might be a problem, but it has functioned properly for about a month so far. falls short as a turntable preamp! This preamp appears to have flat frequency response over the audio frequency range. This is not what is needed to properly condition the output of a turntable. An amp conforming to the RIAA frequency curve is needed to provide a flat signal to the amp. Proper sound requires the app's tone controls to be set in awkward positions to attempt to provide compensation which should be the job of the preamp. I do not recommend this product for use with a turntable. I don't have a scope anymore to check the waveform, but from a listening standpoint It works as it was intended. 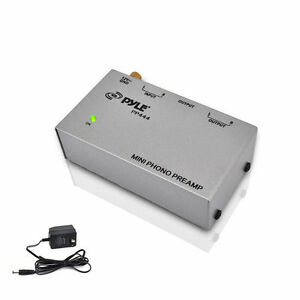 I am using it on a Pyle amp's AUX input to test a couple of my old turntables. I can tell the difference in cartridges through this preamp and the amp. Good for a bench setup. I wouldn't need it if it weren't for the amp I am using to test with. House system is an old Yamahaa 130 watt amp with an old pair of Bose 501's in the front and back Old Yamaha PX3 and Pioneer 909 tape deck. IThe Yamaha/Bose sounds much better than the bench system, but then it cost a few more buck, eh! If you have an old turntable and a bunch of old albums that you haven't listened to in years, spend a few bucks and get this pre amp. It is not high end by any means but it does the trick. I can now play my records through my computer. It can also be used with a reciever like in the old days (current recievers don't have built in pre amps any more). With the right software and a little time you can even digitize your collection. There is a bit of a hum with this device but I believe with the right grounding arrangement I can get that to go away. Inherited a nice technics SL 1300 and needed an amp. Did not want to spend a lot of money. This works perfectly and has all the features of a more expensive midel. 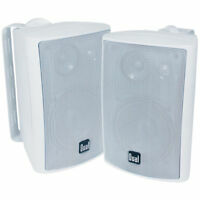 Super easy to set up, just plug and play.